Okay, guys. Fall is coming. We cannot deny it any longer, it starts in 3 days. SO basically, I am ready to share ALL the comforting, roasted and Autumn-inspired recipes. These Roasted Roasted Garlic and Kale Potatoes are one my favorite recipes to make when the weather starts to crisp up and cool down. For all my Canadians friends of there, Thanksgiving is just around the corner! It’s going to be my first Thanksgiving with J in Toronto. 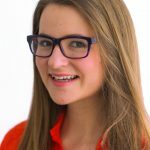 We’ve celebrated it together for the past two years in Belgium (this girl loves her Thanksgiving, lol!) and this will be his first time experiencing what Canadian Thanksgiving is like in Canada! I’m seriously excited and have already started dreaming up some awesome holiday-inspired recipes to make for our meal and share with you guys! 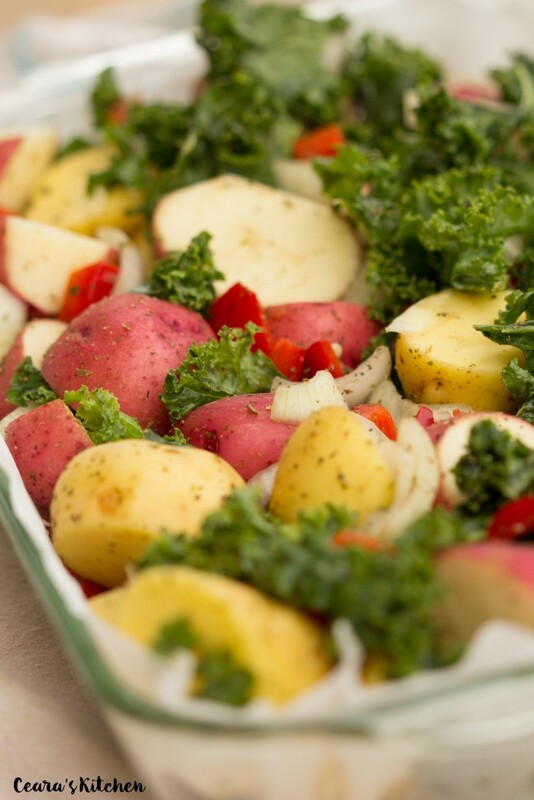 These Roasted Garlic and Kale Potatoes make a flavorful, comforting and nutritious side. The potatoes brown and crisp right up in the oven and the kale becomes super crispy – like kale chips! 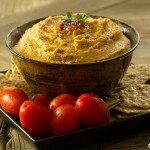 I love serving this at family get-togethers and holiday parties – they are always a huge hit. Preheat oven to 400F/200C. Line a sheet pan with parchment or brush with olive oil. Chop the baby potatoes in half or quarters. Remove the hard stems from the kale and chop the kale into medium size pieces (not too small, not too big). Chop the onions and red bell peppers into medium size pieces. 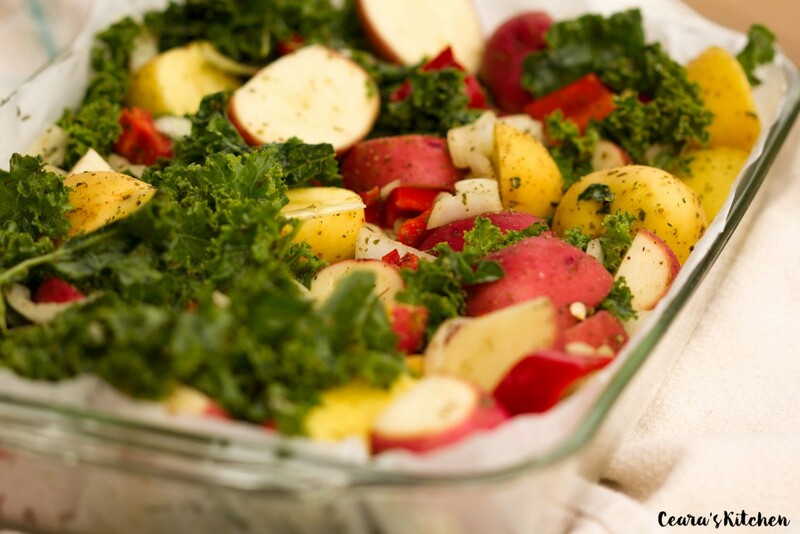 Toss the potatoes, kale, onions, peppers and garlic with the herbes de provences, sea salt, black pepper, apple cider vinegar and olive oil until evenly coated with the spices. 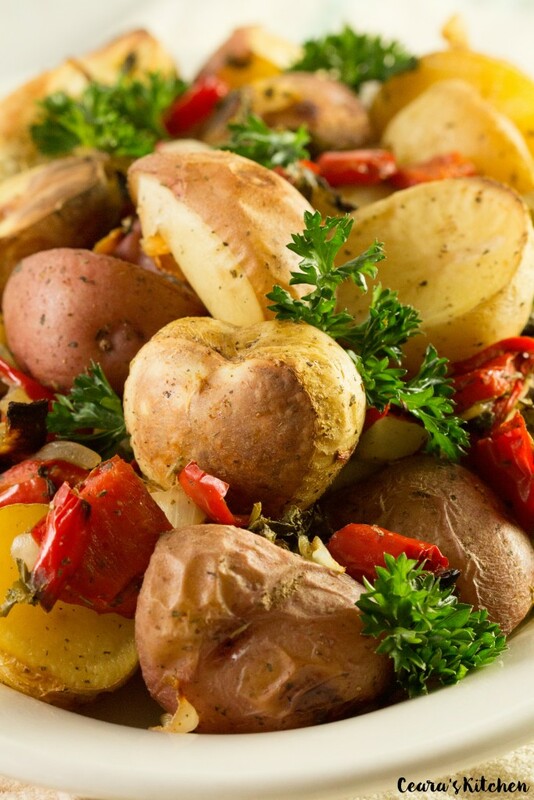 Transfer the potatoes to a sheet pan and spread the potatoes and vegetables evenly over one layer. 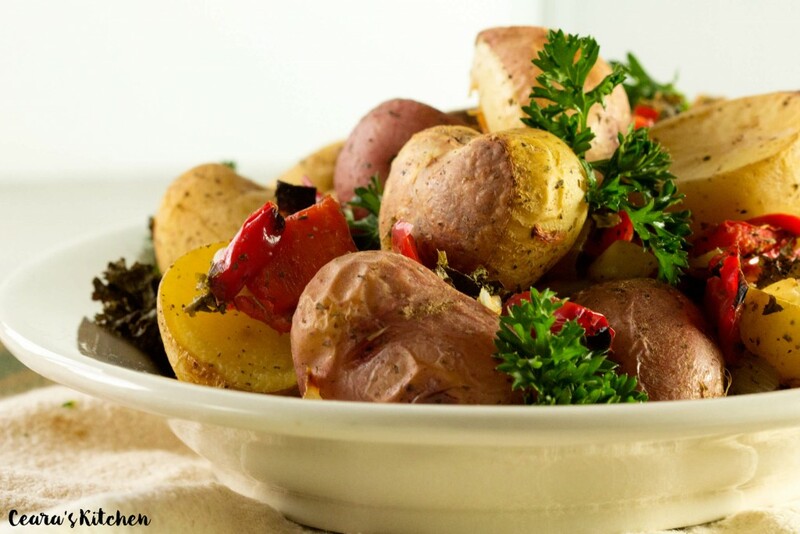 Roast in the oven for 45 – 60 minutes, flipping the potatoes twice so they do not burn. Roast until the potatoes are brown and crispy on the outside and soft and cooked on the inside. Garnish with fresh parsley. Serve warm. 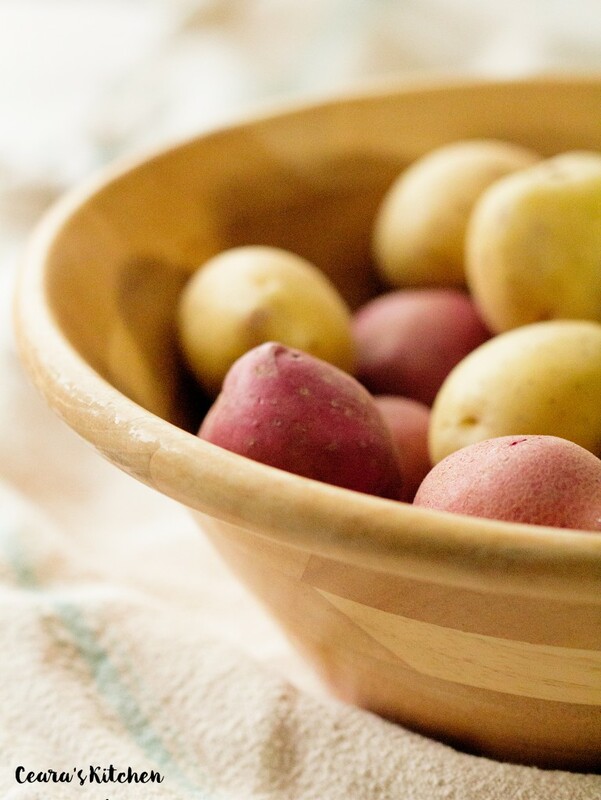 1) I like to use a mix of red and white baby potatoes for some extra color. [br]2) For an oil-free version, leave the olive oil out of the roasted potatoes. I prefer this recipe with olive oil though. Roasted potatoes are awesome, so easy and taste so good! love this! 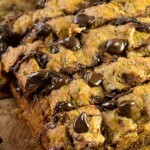 <3 Glad you are on board for holiday recipes!! Kale and potato sounds sounds lovely! Thanks Natalie!